Two balls, coach passes to 1, 3 flex screens for 4, who cuts high or low for a pass and layup., passer 1 goes to the shooting line. 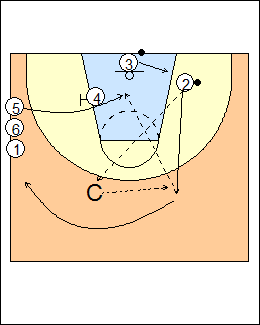 Option - 3 posts when coach has the ball, coach ball fakes inside then passes to 1, 3 front pivots to screen for cutter 4, then ducks in or optionally steps toward the short corner if 4 goes over the screen. 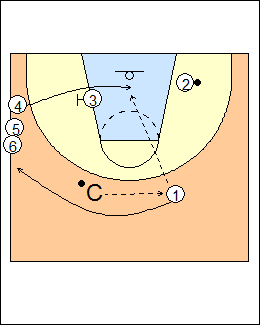 See Offence - Maryland flex, Shooting - 2-shot flex screens, Gonzaga screening. Rotate shooter to screener to passer, 4 is the next screener, 3 rebounds and goes to the passing line, 2 passes to coach and comes high as the passer to 5.